The life-size St George and the dragon made their first appearance at Sudbury on Show at the beginning of March, and a number of children and adults were photographed. George will continue to appear around the town, including a visit to Tesco who have added their name to the list of willing sponsors, alongside (…) Waitrose. Both supermarkets are giving generously to support the event. 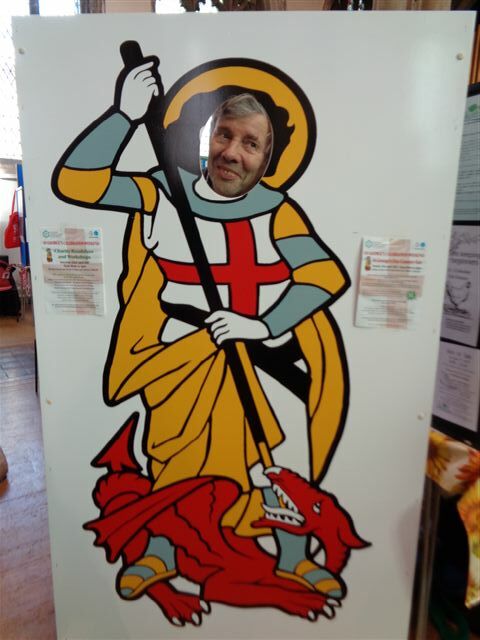 St George will be appearing at numerous locations, on street signs and banners, to promote the 23 April Country Fair at Sudbury Cricket Club ground. Time is now running out for voluntary and community organisations to sign-up for the free Charity Roadshow on Saturday April 22, offering a choice of 8 different Workshops at the Quay Theatre and The Jetty in Sudbury; among the most popular are the sessions offering Ten Top Tips on Writing Good Funding Applications, Recruiting and Managing Volunteers, Marketing and Publicity, Managing a Group’s Finances and Speaking and Presentation Skills, but there are still spaces available on these and on the Smarter Working with IT and Energy Saving sessions. So it is important to contact Robin Hodgkinson on 01787 312140 if you wish to take part as applications will close on 31 March. The closing date of 31 March also applies to nominations for Volunteer Awards which will be announced at a ceremony at 4.00 p.m. on April 22, in the Quay Theatre auditorium. This is a ticket only event and invited guests will be welcomed with tea and cakes, before joining the nominees to find out who has been chosen to receive awards under the different categories. Three finalists will be chosen for each award and the winners presented with a shield, with runners up receiving certificates. The categories are: Young Volunteer (under 18), Young Volunteer (18-24), Long Service Volunteer, Older Volunteer (over 65), Starting a Voluntary Organisation in the last 5 years, Sports Volunteer of the Year, Arts Volunteer of the Year, Horticultural or Environmental Volunteer of the Year, Community Volunteer of the Year and Charity Volunteer. Robin Hodkginson on 01787 312140 can provide more information. Voluntary and community sector organisations which have not already applied to have a stall to raise funds for their own good causes at the St George’s Day Country Fair at Sudbury Cricket Ground, on Sunday April 23, also need to apply before 31 March, as spaces will be limited and only those who have applied before the deadline can be included in the programme for the event. Stalls will be many and varied. The usual bottle, cake, tombola, raffle, plants, bric-a-brac stalls will be supplemented by a range of games, including Splat the Rat, Critter in a cage, Play your Cards Right, Find the Dragon’s Treasure. At their suggestion, the Friendship Dancers are also taking part in a very full programme of entertainment and hope to encourage visitors to join them in some Eastern European dances in the arena. With Punch and Judy, a magic show, circus skills, balloon modelling, face painting, the award-winning Gymnastics Team from Pot Kiln School, Sudbury Phoenix Community Marchers, and Ben the Busker, there will be plenty for everyone to enjoy. Alongside all of this, each recreational organisation in Quay Lane will be offering taster sessions, including rowing, canoeing, tennis, bowls, cricket and hockey and a ‘Beat the Street’ competition will also take place. Primary school children too will need to note the closing date of 31 March, to submit their competition entries for poetry, short stories, paintings, drawings and sculpture. Entries may be left at Sudbury Town Hall or delivered/posted direct to Sudbury Market Town Partnership at 1 Bank Buildings, Station Road, Sudbury, CO10 2SP. Lesley Ford-Platt on 01787 372171 is the contact for the St George’s Day Country Fair. Application forms for both the Saturday and Sunday events can be obtained from Sudbury Market Town Partnership’s web site: www.sudburymarkettownpartnership.org.uk.